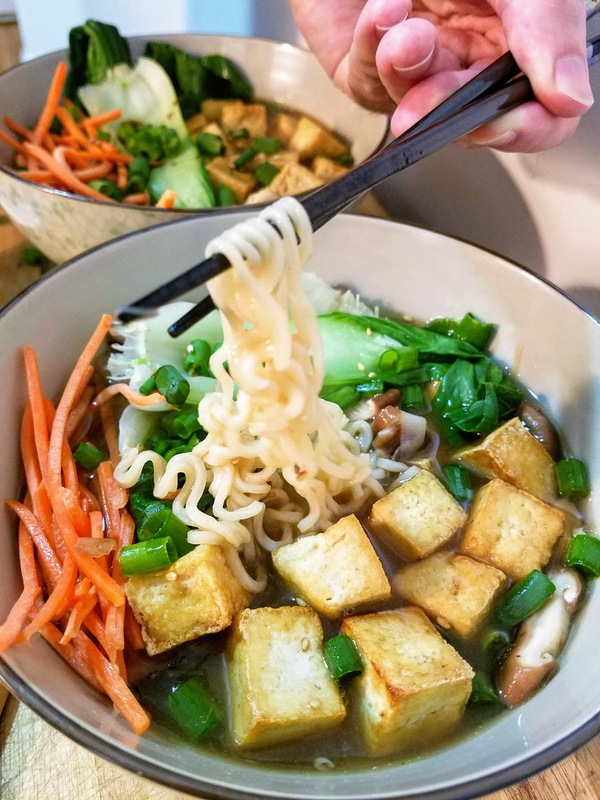 Ramen noodles - not just a college student's favorite 50 cent insta-meal. Ramen is a wonderful brothy Chinese noodle soup that's typically topped with pork, eggs, sprouts, green onion, and other various toppings. But with ramen it's all about the broth, baby. 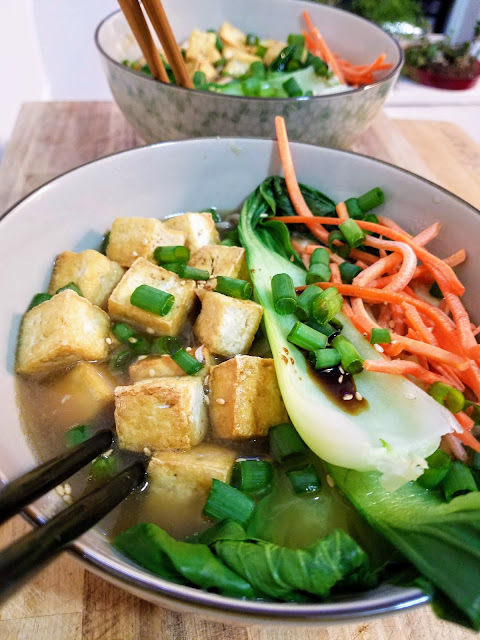 I really try to be an "under an hour" chef so I made a quick version (recipe below), but ideally this broth should be simmering for 1-2 hours to get as much flavor as possible. You can't fault my quickie ramen though, especially since it's so easy and the toppings are so yummy! I chose to add fried tofu, baby bok choy, shitake mushrooms, carrots, scallions, and sesame seeds to our ramen noodles and broth. The toppings were all whipped up quickly while the broth was simmering away; it was ready to assemble in about 40 minutes. We slurped it up joyously with our new Chinese soup spoons and chopsticks (but don't worry, a regular spoon will do just fine!). The best part about this recipe is that it doesn't take any obscure ingredients, and besides the bok choy and shitakes, they are all probably things you have on hand or regularly purchase from the grocery store. 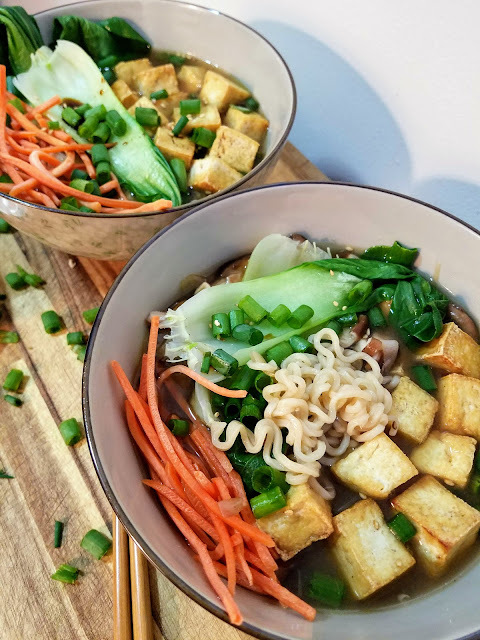 It doesn't take a ton of effort to add a bit of variety into your weeknight meals, and it definitely adds a lot of fun to dinner time + all the health benefits of a varied diet! I hope you give this recipe a try. Heat a large, deep saucepan over medium high heat, and once hot, add sesame oil, onion, garlic, and ginger. Saute for 2-3 minutes or until the onion edges are browning. Add 1 cup of vegetable stock and using a wooden spoon scrape the bottom of the pan. Add remaining vegetable stock, bring to a boil, and reduce to simmer for about 25 minutes, or longer if you are still preparing your toppings. Add mushrooms to the broth for the last 5 minutes of simmering. Meanwhile, prepare the toppings. 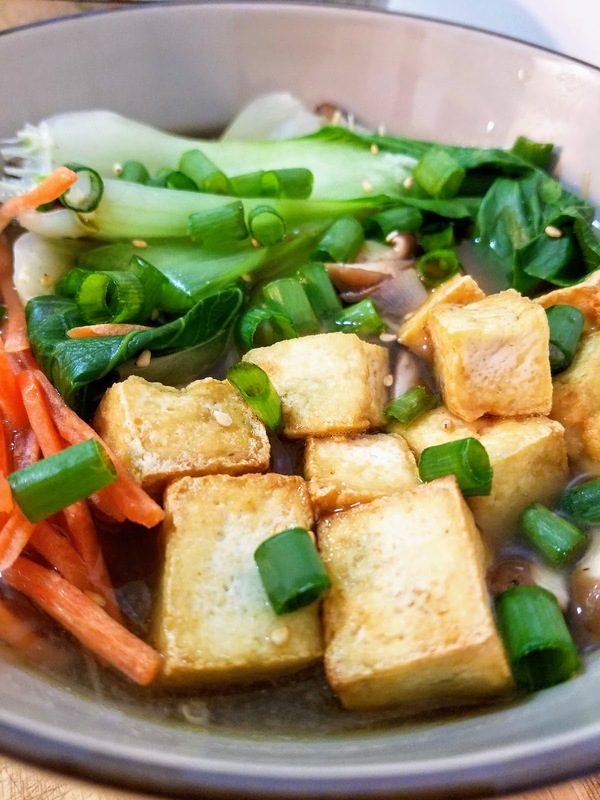 In a large skillet, heat vegetable oil over medium high heat, and once hot, add tofu cubes to flash fry. Turn every 30 seconds until they are golden brown on all sides. Drain on paper towels and set aside. Bring 2 cups of water to a boil in a small saucepan and add noodles to cook for 3 minutes. Drain and divide between two serving bowls. Set aside. Gently steam bok choy leaves for 2-3 minutes or until stalks are slightly softened and leaves are wilted. Spoon mushrooms and broth in the bowls to just cover the noodles. 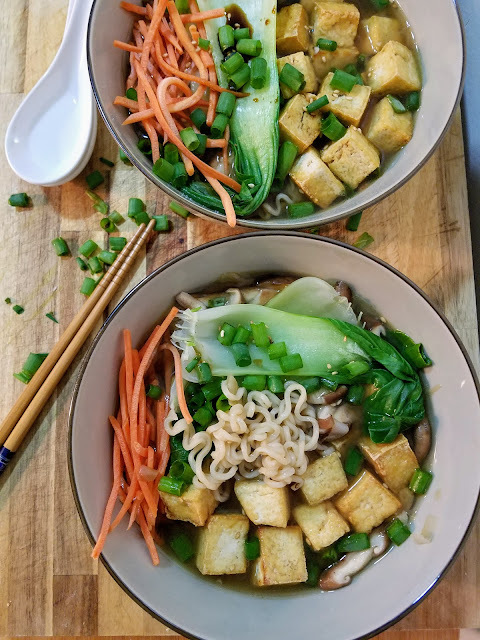 Top with fried tofu cubes, matchstick carrots, 2-3 leaves bok choy, scallions, and sesame seeds if using. You can also add another dash of soy sauce before serving.